My dad loves cycling, however he has dystonia which reduces control of the muscles in his hands. He can still cycle, however this becomes very painful after a moderate period of time due to gripping the handlebars, and also reduces his control of the bikes movement. My dads right arm is better than his left, and he still has control in his forearms, so if possible the device would allow him to steer using his forearms. Any help would be appreciated. 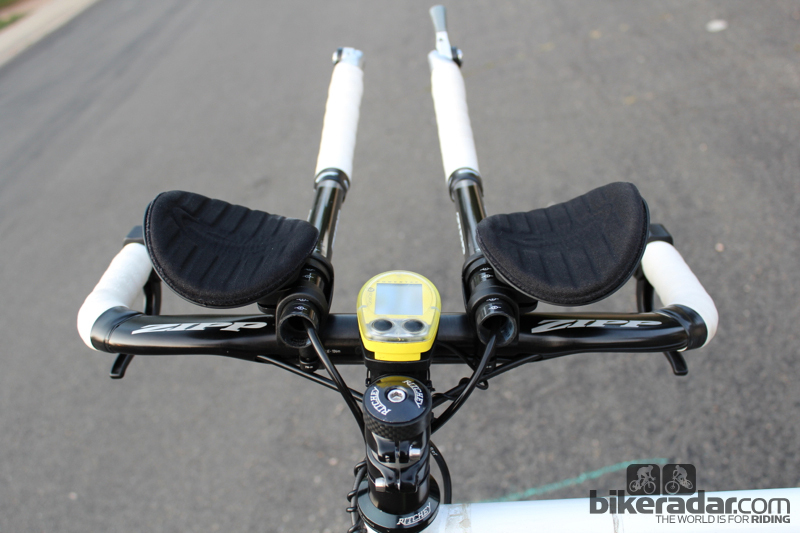 Not exactly what you are after, but a set of clip on aero bars would provide basic control with the forearms for changing road position and gentle curves. Although depending on flexibility it might not be possible to find a comfortable position. 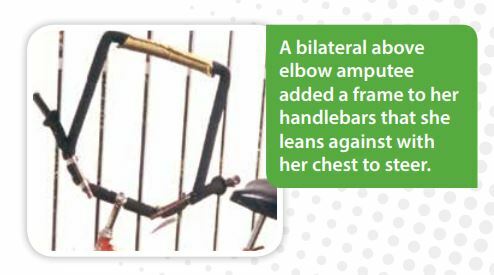 So I don't know much about the disease you mentioned - but if the symptoms are caused by the strain on the wrists and hands, then I have a perfect but expensive solution: Switch to a recumbent. There is no weight on the hands, ever, on all recumbent types. Under seat steering handlebars allow the hands to rest next to the torso in a very relaxed fashion and pretty much straight, like hanging down beside the torso except the whole arms are angled somewhat towards to front. Above seat steering handlebars probably allow for more variations on the grip, but I think the posture is overall slightly less relaxed, you can't let the arms just hang down as much. Center steering recumbents with no handlebars (or handlebars not used for steering but only to mount brake handles) don't need any arms at all (well, if you mount coaster brakes), but more control of the rest of the body and are probably harder to ride. I'm pretty sure all of those types also exist in three wheeled versions if the disease further progresses and makes balancing too hard. The Founder ( Tom Wheeler ) had a massive crash while riding downhill and can't use his right hand properly. He adapted his bikes and with the help of 3D Printing he is now making his own stuff to be able to ride again. I think you can shoot him a mail and see if he is able to help with some tips or stuff. Not the answer you're looking for? Browse other questions tagged handlebars modification adaptive disability or ask your own question. Why are my handlebars difficult to turn in one direction but not the other?